We were the first ones to arrive at the Saratoga Blossom Festival on a clear but chilly March morning. Anticipating a warm afternoon, we found a shady spot along the orchard path that leads from City Hall and the historic Warner Hutton House to the City Library. 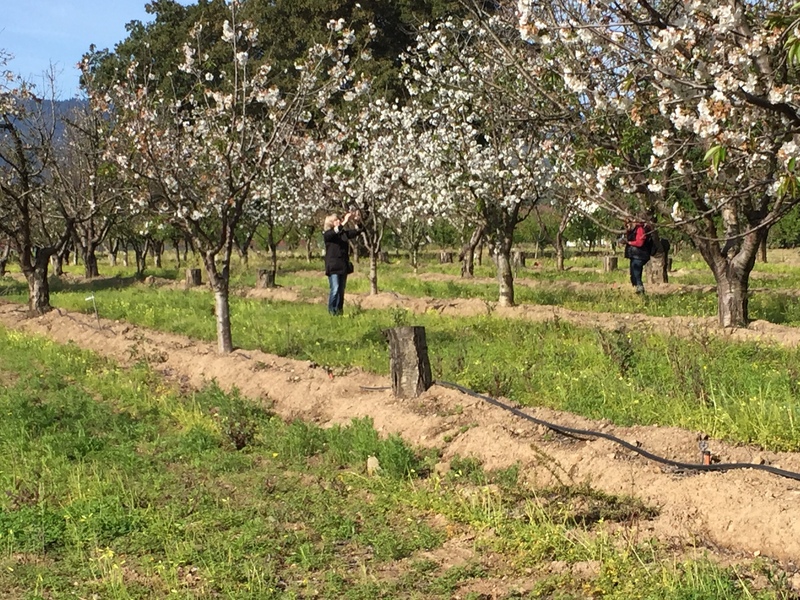 The Saratoga Heritage orchard lies between the two and it was not long before Master Gardeners, Santa Clara beekeepers, historic groups, art guilds, clubs, civic organizations, musicians and artists followed suit. We’d heard from event organizer Annette Stransky, President of the Saratoga Historical Foundation and Museum, that the most popular event would be the petting zoo and our spot was directly across from it – after all, kids like apricots too! It was delightful to have blossoming cherry trees right behind our stand. The 14-acre Heritage Orchard contains many orchard varieties, including apricots, French prunes and cherries and is maintained as a working example of Saratoga’s agricultural past. 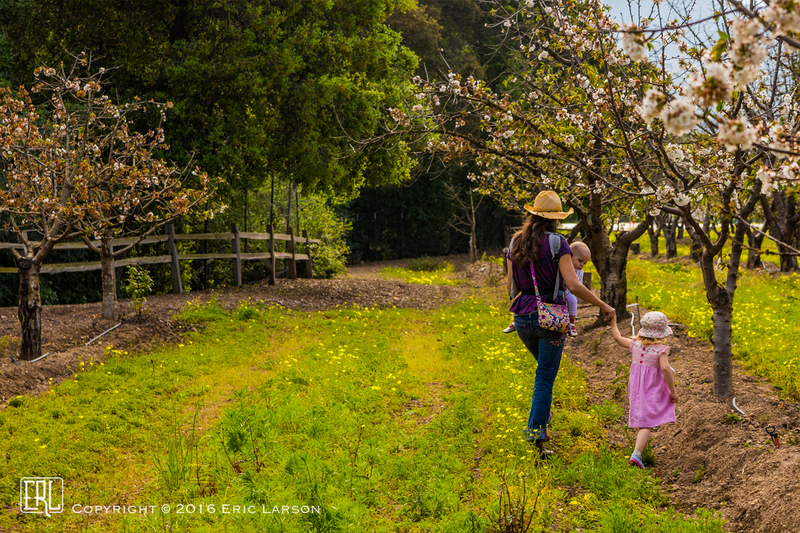 The orchard acres are managed by our friends, the Novakovich family, who have owned local orchard properties since 1925. I was happy to see the young apricots gaining size and color on the trees, with a random blossom or two making a late appearance. 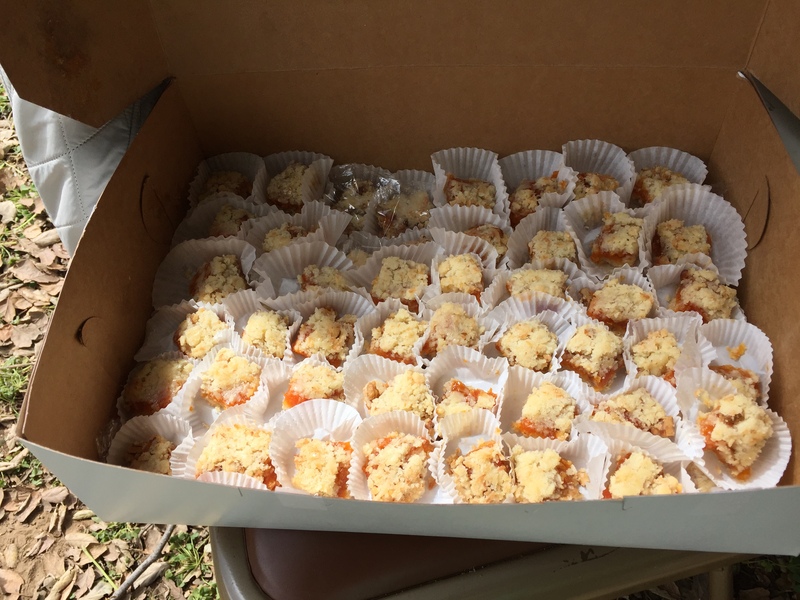 The day before, Neal and I had made dozens of Apricot bars to give as samples at the Blossom Festival. Martha created a recipe card (see below) to advertise the forthcoming For the Love of Apricots cookbook and this blog, with photos by Eric and Jessica — a full team effort! It made perfect sense to sell the Novakovich’s dried Blenheim apricots too and fortunately, the family was happy to oblige with 45 1-pound bags. It was hard to know what demand there would be? After setting up, there was time to wander around a bit. 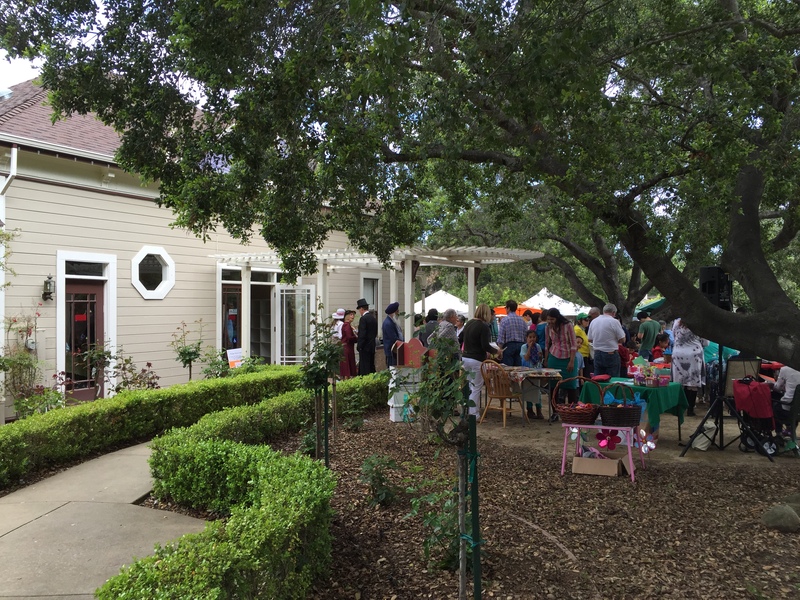 The well-maintained gardens in front of the Warner Hutton house were filled with busy stalls selling handmade art, food, jewelry and clothing. Nearby, a collection of antique cars and gas-powered engines were on display. Further along the garden path, the gazebo featured poetry readings and music groups, which attracted lots of attention. I admired the handsome Victorian but could not remember the historic house from my childhood and learned that it was moved to this site at 13777 Fruitvale Avenue after I had grown up. The house was built in 1896 on a 200 acre ranch (on Sousa Lane off Quito Road), and is currently used as the City’s teen center. It has been beautifully restored and for the Blossom Festival, was in full use. Inside, the Parlor room featured lectures and movies about the history of Saratoga and the Santa Clara Valley, the dining room contained a large table with aerial photos of Saratoga through the decades as well as contemporary books on the region and its history, and in the kitchen, samples of dried prunes (donated by the Novakovich family) were available for tasting. I was pleased to see that several of the books on my shelf were for sale, including “California Apricots: Lost Orchards of Silicon Valley” by Robin Chapman and “The Last of the Prune Pickers: A Pre-Silicon Valley Story” by Tim Stanley. Not long after the Blossom Festival got underway, an attractive woman stopped at our table to sample an Apricot Bar and it did not take long to learn she was author Robin Chapman, who was looking for inspiration to bring back to her hometown Heritage Orchard in Los Altos. We had a lively conversation before others crowded in for samples and talk. All day, a stream of people passed by and I was struck at the modern diversity of the citizenry compared to my childhood era of the ’60s and ’70s. Silicon Valley has of course attracted people from all over the globe and this was evident in the folks attending the festival. As a result, comments varied from warm memories about apricots and living in and near orchards to curiosity about a free sample (many people offered to buy the apricot bar tastes but I refused, they were too small). I became aware that many of the Blossom Festival visitors were drawn to the event not out of nostalgia but rather the idea of a free cultural festival located in nature. Overall, everyone expressed delight about the delicious Apricot Bars and interest in the cookbook project. We were lucky that the hundreds of cookie samples lasted almost until the end of the day. The Novakovich Orchard dried apricots were a big draw for people and we sold out after a few hours, leaving some disappointed passersby. 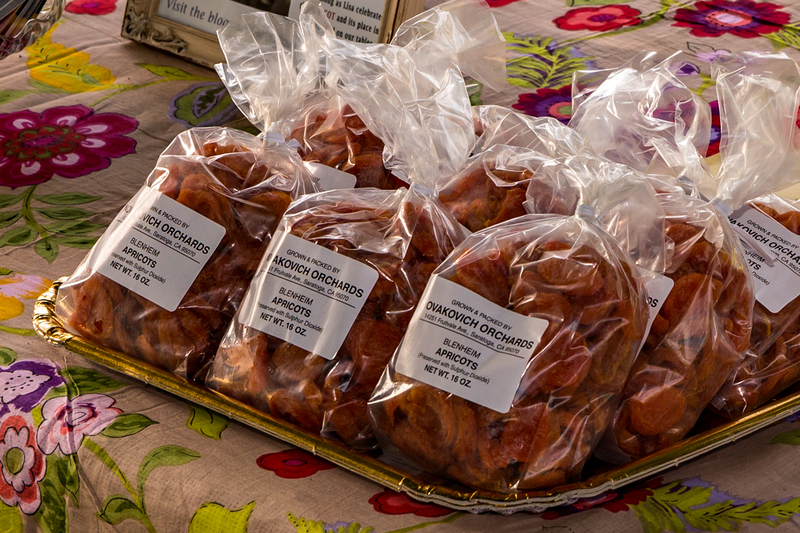 I enjoyed pointing out that these were the apricots used in the Apricot Bar recipe and that their commercial orchard is the last one remaining in Saratoga with fabulous fruit for sale 6 days a week. Conversations with strangers were interspersed with visits by old friends and family. Several Saratoga High School classmates, including Mark Vuko who took some great photos of the day, came to check out our wares and share memories of orchard fun and toil during our childhood years. 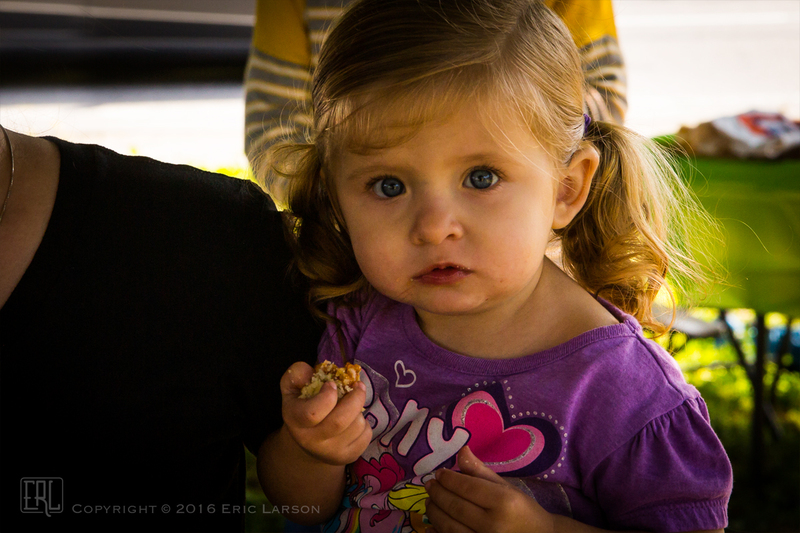 At one point, my brother, our nephew, and their families stopped by for an Apricot Bar sample, a visit to the petting zoo, and a photo. We had a fun, impromptu family reunion! Members of the History Museum dressed up as figures from local history and strolled the paths and exhibit areas throughout the day, offering to describe their past. 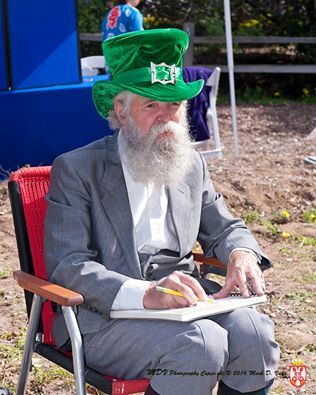 One such gentleman kept busy sketching portraits for anyone with enough patience to wait their turn. 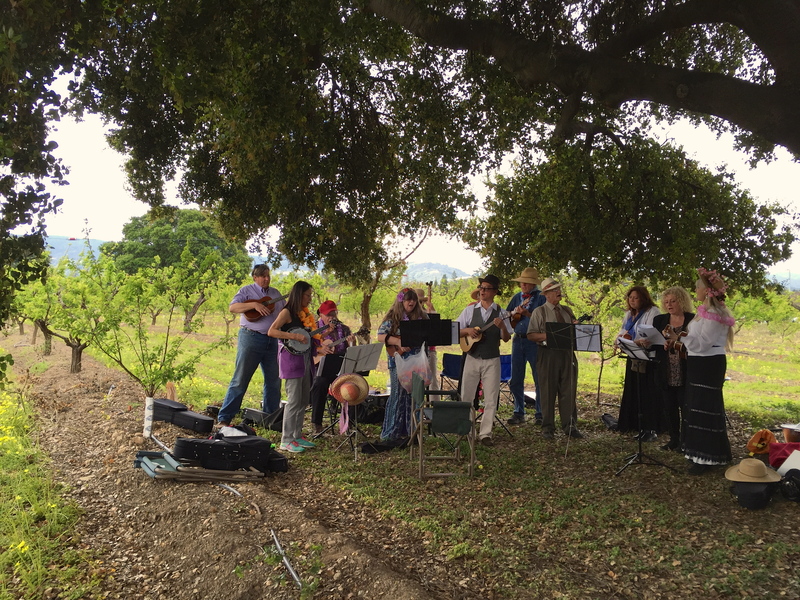 Not far down the path from our table, a folk band ensemble was playing under a huge Oak tree, adding to the festivities. It was a long, fulfilling day and my first time being behind a farmer’s market table! I really enjoyed the experience and opportunity to talk about the Saratoga I knew at the crossroads of its agricultural past and urban present, while sharing apricot treats and news about For the Love of Apricots. My first memory of apricots and my all-time favorite childhood cookie come from my mother Aileen’s Apricot bars, which she made throughout the year. Aileen’s recipe uses jam for the filling, rather than dried apricots, which she always had on hand from her summer jam making. This recipe uses dried apricots rather than jam, which intensifies the piquant apricot flavor, and adds interest with shredded coconut and chopped walnuts in the mix. Despite these added textures and flavors, this Apricot bar recipe is very simple to make and involves a cookie base that doubles as a topping with a reconstituted dried apricot filling that has a jam-like consistency. The result depends upon using the best quality dried apricots available. Whenever possible, use dried Blenheim apricots as they have intense, full flavor and a wonderful chewy texture. The pale and very bland dried Turkish apricot that is popular for its price does not begin to compete with the Blenheim for flavor and texture! Andy Mariani of Andy’s Orchards gave me this recipe that his family makes for all their gatherings. The recipe was the winner of the Pillsbury Bakeoff contest in 1958. I hope you enjoy making these Apricot Bars as much as I do. They are absolute crowd pleasers! Hi Lisa, well after reading your latest apricot blog, I’m going to attempt to make the apricot bars this weekend. I sure hope I can find the good Blenheim apricots locally. After your info I really don’t want to settle for less! I’ll let you know how I do! Thanks!! also grew up here, many “cutting cots”. Thanks for the most delicious sample and sharing the Valley of Hearts Delight poem. Lisa – this is wonderful. A delightful read, and a wonderful passion you are pursuing. Congratulations. I really enjoyed reading your blog and the photos are lovely. Wish I could get hold of some Blenheim apricots – I don’t suppose we have any that will compare over here in the UK. I look forward to trying the recipe. This brought back memories for me too, growing in Los Altos where there used to be lots of apricot orchards. Your apricot bars look amazing and I agree, those pale tasteless dried apricots do not compare to the Blenheims. Pictures on your blog are stunning! Thanks! Hi Lisa, I haven’t been back to Saratoga except for the 60th party. It brought back a lot of great memories of our town and how it used to be. Also to remember all the great people I used to know. I used to climb the trees all around my house. Thanks for bring it back into my life. Dear Lisa! Oh how your blog brought back so many memories of growing up on Glen Brae Dr right in the heart of all those apricot orchards in the 60’s. Better yet I can remember how your mother would make jams and apricot bars when I would come over and hang out together in high school. Those were the days! I love your passion for the beauty of those apricot orchards and the history of Saratoga. I always enjoy coming back to visit the vibrant town of Saratoga and see the change but yet appreciating the orchards that were once there. Hi Lisa, I’ve really enjoyed reading your finely written blog. Your rich descriptions brought back many good memories of growing up in Saratoga, and I am very glad to hear about the Heritage Orchards andthe the Navokovich and Martini family orchards that have survived the chaotic growth in the Valley. Our family moved into our Portos Drive home in 1961, followed by the onlly wintter that brought snow. My walk or bike ride to Fruitvale Elementary and Redwood Jr High took me on a journey through the plum orchard along Fruitvale Ave, and weekend and summer days were spent climbing the orchard’s trees, exploring the adjacent Wildcat Creek and finding it’s hidden treasures and collecting its bounty of tadpoles and spiders with gradeschool friends/neighbors Neal Casteel and Dan yore. I look foreward to reading more blog entries and trying my hand at making those delicious apricot bars. Wishing you all the best. I almost hope I don’t find a job after college so I can come home and try all your beautiful new recipes! Proud of you, Momma. What an awesome blog! I enjoyed the post and the photos. I look forward to trying that apricot bar recipe! What a treat! Your description of Saratoga and the Heritage Festival really took me back to those days of growing up in Saratoga. I still love apricots especially fresh off the tree warmed by the sun. It is so sad to see how all the wonderful apricot and plum orchards have been replaced with housing and commercial developments. Thanks for all you are doing. I look forward to your book. I’m sure it will be wonderful! I could almost feel the sun, smell the blossoms and taste your wonderful apricot bars. In fact I would love to, because I do know a bit about what you can do with apricots : ) Well written Lisa, I think your book is going to be a huge success. What a wonderful description of sights and sounds and people and most important, apricot bars! I am thoroughly enjoying reading your blog. Thanks so much, Mike. I’m delighted to know you are enjoying the blog and of course, you’re always invited to taste test when you’re visiting! Delightful to read. Love the photographs. Wish I’d been there -sounds utterly delightful and delicious! Vivid descriptions of the day. I’m struck with how authentically you your written voice is. That’s a rare quality, lovely and unpretentious. Marcia, your comments mean so much to me; thank you! It’s wonderful to have your wise eyes and warm heart along with me on this journey! you do for this Festival.